"Only I can live forever." It's an end of an era. Warner Bros has debuted the official trailer for Harry Potter and the Deathly Hallows: Part 2 after its world premiere during the ABC Family presentation of Happy Gilmore on TV tonight. We all know where this is headed, we've all seen the first half of the end. Now we get an incredible glimpse at the epic finale coming this summer. Get ready to hold your breath. This looks absolutely phenomenal! I have chills. Enjoy! 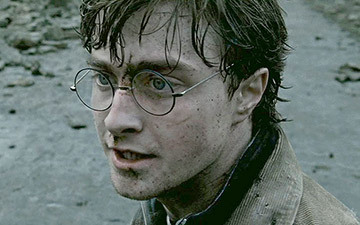 Harry Potter and the Deathly Hallows is again directed by British filmmaker David Yates, of Order of the Phoenix and Half-Blood Prince previously. The script was also written again by Steve Kloves, of Sorcerer's Stone, Chamber of Secrets, Prisoner of Azkaban, Goblet of Fire, and also Half-Blood Prince, but not Order of the Phoenix. This is based on J.K. Rowling's very popular series of books which have already concluded. This movie hits theaters in 3D (what a surprise - rolls eyes) on July 15th, 2011. I'm really sad this series is finally coming to and end. After reading the book I have to say watching this trailer has me feeling so many different emotions. Sooo good!